The new Watch series 3 with cellular support is now available for purchase on Airtel and Reliance. Both the network carriers are offering free data services for Apple smart wearable. The new Apple Watch series 3, which has been up for pre-order on Reliance Jio and Airtel for almost a week, is now finally available for purchase off-the-shelf in India. Unlike in the US, where network charges a minimum of $10 (approx. Rs 673) per month for data consumption on Watch series 3, both Airtel and Reliance Jio are offering free data services for Apple smart wearable owners in India. However, Airtel is offering the freebie only to postpaid consumers with Infinity plan. On the bright side, it is offering Rs 5,000 cash discount for consumers buying using ICICI card. On the other hand, Reliance Jio users (with prepaid or postpaid plan), they are entitled to get free internet, they just have to install the JioEverywhereConnect app on the Apple Watch series 3 cellular model. As far as the pricing is concerned, the standard Apple Watch series 3 model costs Rs 39,080 and comes in an aluminium case with a sports band (or sports loop option). It also comes in sub-variant with high-grade stainless steel case with sports band or Milanese loop option. The Nike+ version also features an aluminium case with Nike-branded sports band (or sports band loop option) and costs Rs 39,130. On the other hand, special Apple Watch Edition costs a whopping Rs 1,18,030. It boasts premium ceramic case with sports band. Apple Watch Series 3 comes with a premium high-grade case with trendy colourful straps. Under the hood, it houses a powerful and faster proprietary S3 dual-core processor (70 percent better than Series 2) backed by wireless W2 chip (85 percent faster Wi-Fi and Bluetooth and Wi-Fi 50 percent more power efficient), more intuitive watchOS 4. It comes with a daylong battery life (almost 18 hours under mixed usage) and comes with an array of sensors such as the heart-rate sensor and biometric altimeter. It also boasts waterproof certification, meaning you can take the Apple Watch for a swim in the ocean. It is capable of surviving high pressures up to 50 metres submerged underwater. The notable aspect of the Watch series 3 cellular is its in-built eSIM (embedded SIM), which is one-hundredth the size of a traditional SIM. With this advanced technology, users need not even have to subscribe to a new SIM, as it shares same as the one in your iPhone and to capture radio signal, they developed custom plate right below the display. Apple Watch Series (with future software updates) will be able to detect subtle/high changes in heartbeats and warn the user of cardiac arrhythmias, or abnormal heart rhythms. And also, Apple Watch will also be able to help diabetic device owners to keep a tab on their health via connected blood sugar monitor. 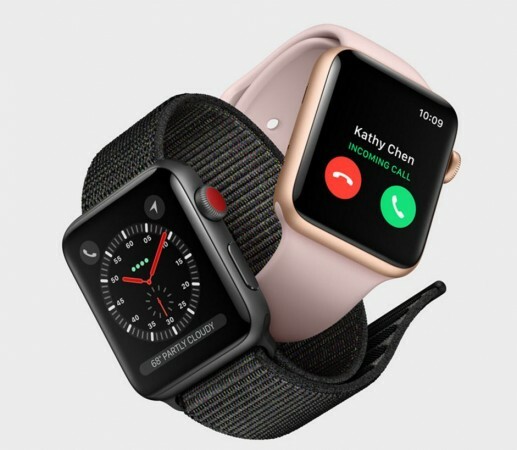 Apple Watch Series 3 (GPS + Cellular), which comes with an electronic SIM can be used with customer's existing Airtel or Reliance Jio number. Apple iPhones compatible with the Apple Watch Series 3 include iPhone SE, 6 (& 6 Plus), 6s (& 6s Plus), 7 (& 7 Plus), 8 (& 8 Plus) and iPhone X. The phones will need to be upgraded to iOS version 11.3 or above. To activate cellular service on the Apple Watch Series 3 (GPS + Cellular), customers first need to update iPhone to iOS 11.3 and watchOS 4.3, then tap Settings on iPhone > General > About and follow the prompt to update to the latest carrier settings. Stay tuned. Follow us @IBTimesIN_Tech on Twitter for the latest news on Apple.